Anyone who keeps birds will understand just what lengths you go to in order to keep your feathered friends happy and healthy. Birds that live in cages can live very happy lives as long as they are adequately cared for. As a bird-keeper you are responsible for feeding them and ensuring that they have a clean and pleasant cage. But beyond that you also have a responsibility to keep them healthy and entertained and this is why additions such as bird cage ladders are so essential. 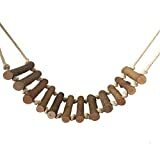 If you notice that your birds are looking a little lacklustre then it may well be that all they need is a little extra stimulation in their cage. Boredom is a big problem for birds so it is absolutely crucial that you provide them with enough entertainment to keep their minds stimulated, just as they would be in the wild. A new toy, swing or ladder can really perk them up and give them a new lease of life, and you will be able to relax, safe in the knowledge that you are doing all that you can to give your birds the life they deserve. Ladders are a brilliant and inexpensive way to keep your birds healthy and happy. When he is navigating the ladder he will be building, strengthening and toning muscles in his legs, neck and torso and he'll also be burning off loads of excess energy in the process. 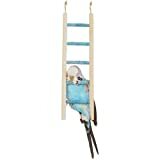 Wooden ladders, metal ladders, plastic ladders and rope ladders are both equally as appealing to your bird and you will find that they are available in a huge variety of styles, lengths, weights and colours. Choose a few different ones and you'll soon see which your bird prefers. Most ladders have hooks at the top so that they are easy to attach to the side of the cage. 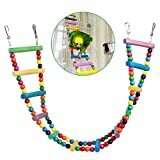 If you're really feeling like spoiling your birds you could build an entire obstacle course made up of different toys, swings and ladders or different colours, styles and designs for them to navigate. Use your imagination and the sky's the limit! Or at least, the top of the cage. 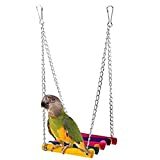 Any bird cage toy, swing or ladder is worth its weight in gold, but they are surprisingly inexpensive when you start looking at prices, so for a little money you can radically improve the wellbeing of your pet birds. Small wooden ladders can cost as little as a couple of pounds, while you'll pay more for larger ladders and more complicated toys and swings. Pick stimulating designs and colours in order to transform a dull cage into a fun and exciting playground for your birds. You'll simply love sitting back and watching them thrive in their stimulating new environment!